This detached lodge is set on a small park with similar properties in Billingsley near Bridgnorth and sleeps four people in two bedrooms. Beech Lodge is a detached lodge set on a small park with similar properties in Billingsley near Bridgnorth. 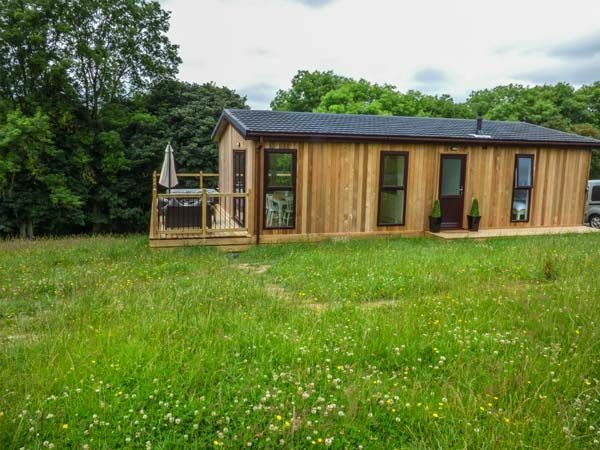 The lodge can sleep four people in two bedrooms which are a double and a twin room. The double room has Jack-and-Jill access to a bathroom and there is also an open plan living area with a kitchen, dining area and a sitting area. French doors lead to the decked area where there is a partially sunken hot tub. There is also off road parking for two cars. In a lovely rural area with plenty to see and do, Beech Lodge is a fantastic base for families and friends alike. Amenities: LPG central heating. Electric oven and gas hob, microwave, fridge/freezer, washing machine, dishwasher, TV with FreeSat, DVD, CD, WiFi, selection of books, games and DVDs. Fuel and power inc. in rent. Bed linen and towels inc. in rent. Off road parking for 2 cars. Decking with furniture, BBQ and hot tub. Sorry, no pets and no smoking. Shop 7 miles, pub 2 miles. Note: Although all on the ground floor, this cottage is not suitable for wheelchair users. Region: A E Houseman once wrote that Shropshire was the quietest place under the sun and today the county remains something of a rural idyll, recognised as one of the least crowded and most peaceful regions in England. Town: Billingsley is a small village surrounded by beautiful Shropshire countryside, 7 miles from Bridgnorth. The area offers excellent walking, and boasts easy access to a wealth of country parks, great houses, museums and picturesque Shropshire villages. Enjoy a visit to the delightful Bridgnorth, winner of Britain in Bloom', which comprises of the High Town and the Low Town, connected by winding streets and flights of steps. All ground floor. Two bedrooms: 1 x double with Jack-and-Jill access to bathroom, 1 x twin. Bathroom with bath, separate shower, basin and WC. Open plan living area with kitchen, dining area and sitting area. LPG central heating. Electric oven and gas hob, microwave, fridge/freezer, washing machine, dishwasher, TV with FreeSat, DVD, CD, WiFi, selection of books, games and DVDs. Fuel and power inc. in rent. Bed linen and towels inc. in rent. Off road parking for 2 cars. Decking with furniture, BBQ and hot tub. Sorry, no pets and no smoking. Shop 7 miles, pub 2 miles. Note: Although all on the ground floor, this cottage is not suitable for wheelchair users.